The ICCROM Library and Communications Service are very happy to announce the scanning and digitization of past ICCROM and ICCM (International Council of the Conservation of Mosaics) publications. This is a fantastic opportunity to further ICCROM’s educational and training mandates, while sowing seeds to stimulate new conservation research. Authors, collaborators and contributors to these past publications are invited to read this notice carefully. La Bibliothèque de l’ICCROM et le Service de communication sont très heureux d’annoncer la numérisation des anciennes publications de l’ICCROM et de l’ICCM (Comité international pour la conservation des mosaïques). Il s’agit là d’une opportunité formidable de renforcer le mandat de l’ICCROM dans le domaine de l’éducation et de la formation, et de semer des graines propres à faire germer de nouvelles recherches en conservation. Les auteurs, les collaborateurs et les contributeurs à ces anciennes publications sont priés de lire attentivement cette annonce. La Arquitectura de Paisaje, en los últimos 15 años, ha generado avances extraordinarios y un gran impacto tanto en su ejercicio profesional, como en su relación con otros campos disciplinarios. En el pasado, el interés por definir cómo integrarnos al paisaje y construir un enfoque disciplinar fue fundamental, en el presente, trabajamos inter, multi y transdisciplinariamente por mantener y perpetuar la relación hombre – naturaleza – territorio. Hacia el futuro, intentamos crear una nueva mirada que nos permita encarar las nuevas formas de intervenir en el paisaje y construir una visión más consciente, responsable y significativa sobre nuestro quehacer profesional. Por ello la voluntad por iniciar y mantener un debate constante sobre la intervención en el paisaje, tanto a nivel académico como profesional, nos ha conducido a crear un espacio para albergar y sumar reflexiones, intercambiar opiniones, enriquecer nuestros puntos de vista y nutrirnos de otros enfoques disciplinares que tengan como objeto de estudio el paisaje. La consolidación de este esfuerzo se ha logrado tras siete ediciones del Congreso Nacional de Arquitectura de Paisaje, organizado por la Sociedad de Arquitectos Paisajistas de México (SAPM) y dos ediciones del Congreso sobre Espacio Público, organizado por la Facultad de Arquitectura de la Universidad Nacional Autónoma de México (UNAM). 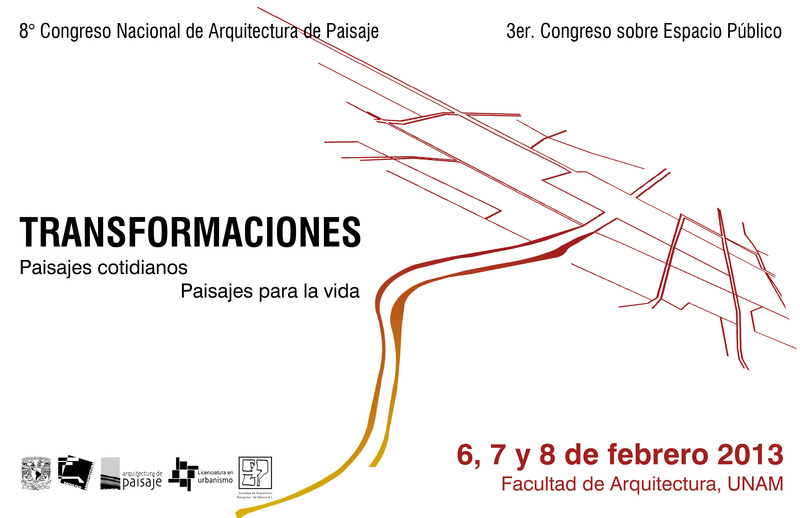 El 8º Congreso Nacional de Arquitectura de Paisaje representa un gran reto ya que se ha convertido en un espacio de debate y profundización sobre el ejercicio profesional de la obra de Arquitectura de Paisaje Mexicana. El evento se desarrollará durante tres días, en los cuales se ofrecerán conferencias magistrales, cursos, talleres, ponencias, exposiciones, presentación de los finalistas y exhibición de proyectos del concurso de estudiantes. MESA 1. El pasado. Muerte o vida del espacio abierto. se mantenga vivo?, ¿Existe todavía una manera de crear un entorno más humano a través del espacio abierto? ¿Cómo reconstruimos el paisaje para que éste forme un sistema vivo? MESA 2. El presente. Paisajes para la vida. La sociedad transformadora del Paisaje. transformaciones en el espacio abierto lo cual ha desencadenado nuevos conceptos y manejo del mismo. Por ello, en esta mesa de discusión se tratarán temas relacionados con paisajes emergentes, espacios multifuncionales, reciclaje urbano, rehabilitación de espacios degradados, recuperación de espacios residuales. Así mismo, también se hablará de los mecanismos para conservar y proteger el patrimonio natural, el paisaje industrial y cultural. MESA 3. Los cambios a futuro. Evolución e innovación en el diseño, construcción y gestión del Paisaje en México. El mayor reto es transformar nuestra mirada y crear una nueva forma de ver el paisaje para generar con ello nuevas estrategias de diseño y construcción de nuestros espacios abiertos cotidianos. Una cuartilla (300 palabras) en formato Word, letra Arial de 12 puntos, interlineado sencillo. Título de la ponencia en mayúsculas y negritas, centrado. Nombre(s) de autor(es) que no deben exceder de tres. A pie de página incluir los siguientes datos: grado(s) académico(s) del ponente(s) (opcional), institución de adscripción, teléfono y correo electrónico. Mesa en la que desea participar. Notas a pie de página con letra Arial en 9 puntos e interlineado sencillo. Citas en texto: apellido autor(es), año, página(s). Bibliografía al final del texto ordenada alfabéticamente. 2. A los autores de los trabajos aceptados se les notificará vía correo electrónico a más tardar el 26 DE NOVIEMBRE DE 2012.
correspondientes presentados en formatos estándares intercambiables (JPG, GIF, WMF). 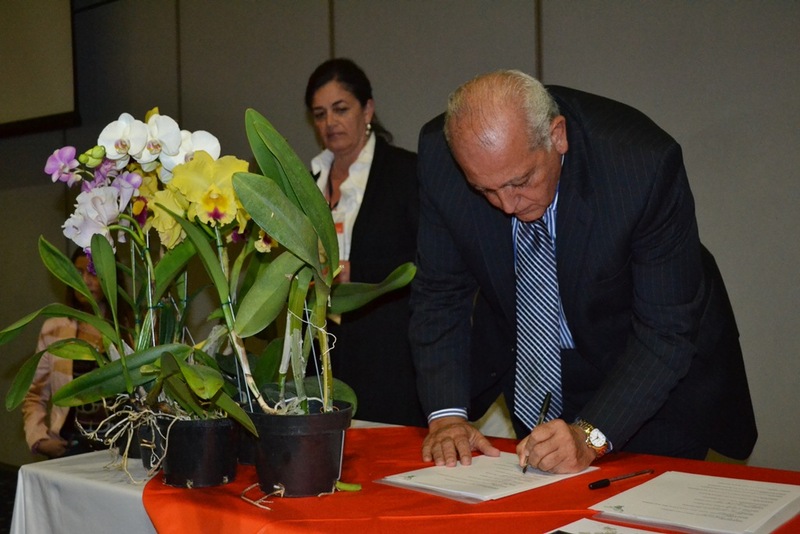 Signature and ratification of the Latin American Landscape Initiative (LALI) by the civil society, the academia, the local government attending the IFLA SAP 2012 Americas Conference, in Medellin, Colombia, October 19. 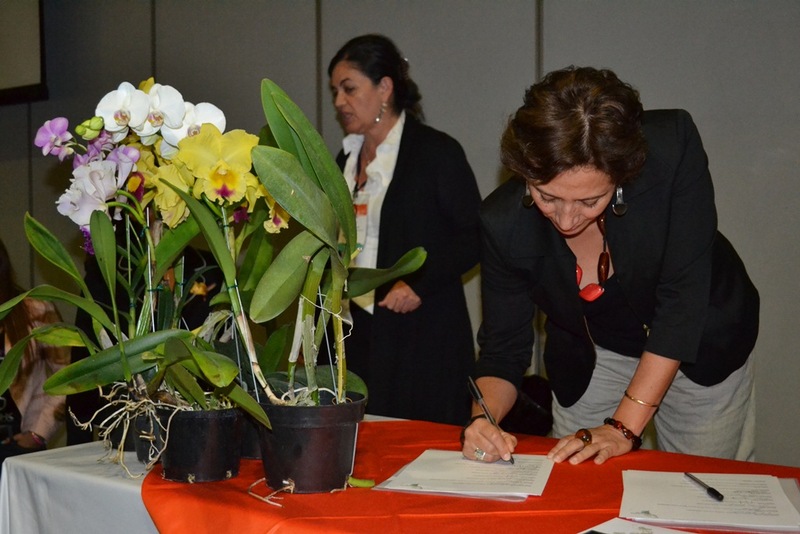 ” LALI is a regional initiative, but its meaning goes much beyond the limits of the Latin America region: it signals the mobilisation of civil society for the safeguarding of important collective values, the ones that are represented by the conservation of beauty, of biodiversity, of traditional knowledge, of heritage in all its forms. Unesco praises the work that you have done during this meeting, and wholeheartedly supports the LALI initiative as a basis for an enhanced regional and international action that will lead to the development of more effective and universal policies, in collaboration with all the main United Nations Agencies, the international NGOs and national and local Governments of all the regions of the world. Nota Bene: Thank you to Martha Fajardo, LALI Chair-ILC task force member and IFLA Former President for this valuable contribution. Among the wonderful events offered next September 2012 regarding Landscape Architecture (IFLA World Congress, ASLA Congress, ECLAS General Assembly, etc) I have to stress attention – for some minutes- on our humble European Biennial of Landscape Architecture of Barcelona. Our 7th edition has to be inscribed within the framework of Spanish circumstances and therefore this edition should be valued as a small miracle performed at a national and European level to maintain the gravity center of the profession for 3 days in the south of Europe, in Barcelona. It is a huge collective effort, finally blossoming and therefore we have to admit we are really proud to announce the panel for next edition. The symposium in its modernist splendid venue at the Palau de la Música, will last three days (Thursday 27th, Friday 28th and Saturday Morning 29th) and includes talks, presentations by the finalists of the Rosa Barba European Landscape Prize, round tables and discussions where it will be possible to track and evaluate the evolution of landscape design in Europe. Day 1: Presentation of the Rosa Barba European Landscape Prize Finalists. The International Jury Panel Members (IFLA President Desiree Martínez, Kathryn Gustafson, Karin Helms and Carme Ribas) have selected the finalists for the Rosa Barbà European Landscape Prize from among the projects presented. A selection of all 7 firms among the 352 presented projects, all of them works built in Europe between 2007 and 2011. The Jury was especially satisfied with the finalist short list, agreed promptly and almost unanimously after several pre-finalist rounds, in during the spring virtual meetings. The 7 selected works, offered a representative and kaleidoscopic overview suitable for all audience, ranging projects from various sizes. From the precious projects of The Written Garden ‘Gardens of the World’ by Marianne Mommsen or the delicate intervention of Michael van Gessel in “Twickel Estate, renovation of the historic park of Twickel Castle” to huge regeneration interventions as the “Ettara, Effluent water treatment station” by Joao Nunes or Tudela Restoration in Cap de Creus by Martí Franch Batllori to outstanding great parks with social success as “Ile Seguin, jardin de prefiguration“ by Michel Desvigne or “Martin Luther King park” by Jacqueline Osty both in Paris or magnificent “Mangfallpark Rosenheim” by Robel Steffan. Marieke Timmermans. Landscape Architect , Head of the department of Landscape at Academy of Architecture Amsterdam and Owner at la4sale, The Netherlands. Julie Bargmann. Landscape Architect, Founding Principal of DIRT Studio and Associate Professor at Virginia University, USA. Gilles Vexlard. Landscape Architect, Founding Principal of Latitude Nord and Professor at ENSP in Versailles, France. Under the title of “The World of Landscape Architecture” and by the hand of different landscape designers and governmental technicians we will over view last 20 years of the discipline according Topos lecture in the occasion of Topos silver jubilee. The second strategic initiative aims to present all stages of works to Biennial participants and outside viewers. From student’s projects to professional works, the compendium of works express our desire to intently study and discuss landscape interventions, as much from the perspective of landscape architecture as from other disciplines that are linked to its study and evolution. A selection of the presented projects, works built in Europe between 2007 and 2011, will available for viewing at the Architectural Association in Plaça Nova, at the permanent exhibition on the ground floor. Those projects are the ones to be compiled in the Catalog of the 7th European Biennial of Landscape Architecture. One more year Barcelona holds the International Exposition of University Projects in the Schools of Architecture and Landscape. The organizing committee considered that the participation of the didactic works remarkably contributed to enrich the debate on the landscape architecture. The final outcome represented 92 schools worldwide, proudly defining transcontinental best practices in our profession. Open exhibition to the outcomes of the latest competition in Landscape and Urbanism in Barcelona. The rearrangement of the 12 gates to the main city Park located in the mountain of Collserola. The works of national and international colleagues will be shown in the Architectural association in order to generate debate on the city’ future and strategic plan. We are proud to think we helped to the European professional evolution overview thorough out the 6 catalog covering a wide range of landscape intervention form 1990 to 2010. Each European Biennial of Landscape Architecture can be traced by two complementary publications disseminating the contents of the Biennial and the Rosa Barba European Landscape Prize. The main one, is of course the book considered as the catalog output. The Catalog of the 6th European Biennial of Landscape Architecture is in fact the physical outcome were the text of the lecturers can be found and the projects selected for the exhibition of the European Biennial of Landscape Architecture are published. Last but not least, we would like to resume the compendium of parallel activities organized during the biennial, thank to the viral effect of the Biennial in Catalan society and resulting with the most valuable initiatives to complement the experience of the event. The importance of accessories today is paramount, even more than the ensemble itself. Accessories speak volumes about an event’s dressing up. Moreover, those accessories made the difference in previous editions and therefore they must be named. The most amazing Award Ceremony will take place in Palau Auditorium: the Announcement of the 7th Rosa Barbà European Landscape Prize winner, followed by the announcement of the International School Exhibition winner, the announcement of Barcelona latest Landscape Architecture Competition winner and the public opinion’s award. The Commission wants to point out once again the importance of live experience with 3 different proposals to approach the city and the latest’s landscape projects. Guided visit to the Llobrebat river rearrangements by the Mancomunitat de Municipis will be provided on Saturday Evening. Bike Tour to the waterfront of the city and slow food itinerary through renewed Montjuic mountain landscape will be available for Sunday Morning visitors. As above mentioned, next September offers many attractive traveling opportunities for professionals aiming to visit and learn on our professions around the world. Barcelona is an inexpensive alternative to focus both in education and professional practice future while enjoying the end of summer in our beloved city. Looking forward to meeting you all there! European Landscape Architecture builds on a common horizon of understanding and yet produces quality works of very different expression and style. IN TOUCH, the latest edition of Landscape Architecture Europe, explores outstanding projects created within the European mindset, diving below the surface in an attempt to uncover the common values that bind European design work. The book presents11 in-depth project ‘features’, which include thematically related essays, and 28 concise project ‘icons’. 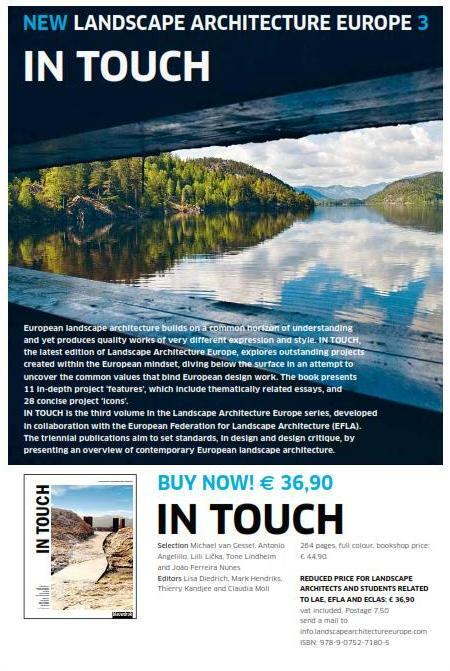 IN TOUCH is the third volume in the Landscape Architecture Europe series, developed in collaboration with the European Federation for landscape architecture (EFLA). The triennial publications aim to set standards, in design and design critique, by presenting an overview of contemporary european landscape architecture. 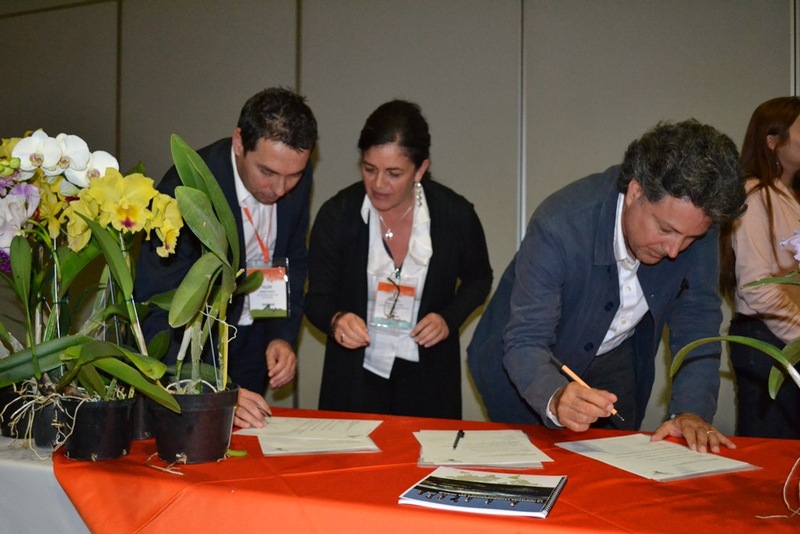 Registration for the IFLA World Congress 2013, being held in Auckland from 10-12 April 2013, is now open. Early Fee Registrations will be accepted up to and inclusive of 30 November 2012. IFLA50; shared wisdom in an age of change’ provides a framework within which to consider our changing landscape through multiple dimensions of wisdom. Whether exploring ancient wisdom, reaching across realms of contemporary knowledge, or imagining a more resilient future, shared wisdom strengthens our ability to effect positive change. 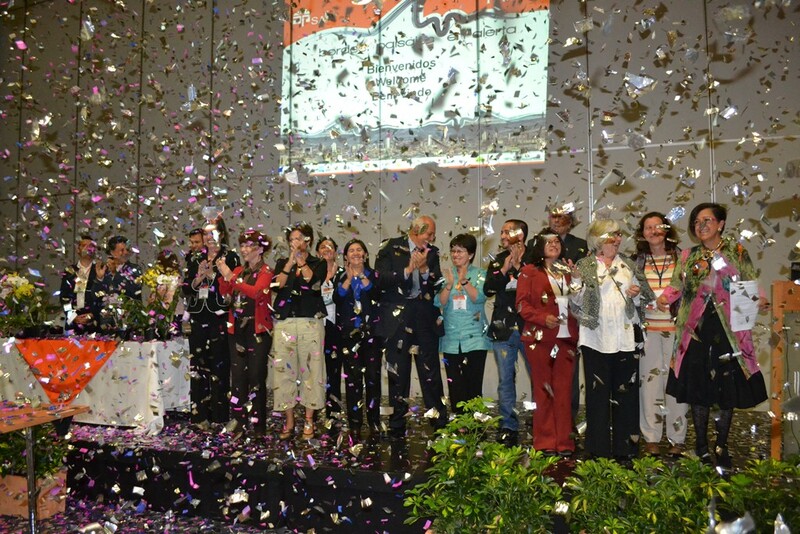 Please refer to the Congress website for more information about IFLA 2013 and to register. We look forward to welcoming you to Auckland in April 2013.